Are your marble, stone, tile and wooden floors looking scratched and dirty? Would your high traffic floor areas look better if they had that good-as-new gleam again? Do you want your office and business premises to be instantly welcoming and attractive to your new and old clients? CLA Commercial Cleaning's stripping,waxing and buffing servicesare the perfect way to spruce up your New York or Tri-State office or business environment. Removing ground in dirt, scratches and nicks from well-trodden floors will help to make your premises look smart and professional again – and offer a better first impression to any new visitors or clients. We can even put the sparkle back on no-wax floors! Over time, high levels of foot traffic will nick and scratch your floor's surface, leaving yourbeautiful floors with anot so quite professional look. Without regular cleanings and maintenance, this damage can become extremely hard to reverse and in most cases very costly to fix. With regular cleanings,waxings and high speed polishing your floors will be more durable, and will maintain their shine for longer periods of time– thus, saving you money over time. Besides waxing and high-speed polishing, we also offer floor stripping, honing, grinding and sealing services. Stripping, sealingand refinishing NY floors to perfection. This is the perfect way to restore the resilience and high-gleam sheen of your natural stone, hardwood, vinyl and linoleum floors. With CLA Commercial Cleaning, our professionals will meticulously maintain your floors adding shine as well as durability. Restoring the luster of Vinyl Composite Tiles Stripping, Refinishing and Sealing. CLA Commercial Cleaning's floor specialists will strip, refinish and reseal vinyl composite tile to remove wax build up and that ugly, yellow film that may have discolored your floor over time. Our professional vinyl floor refinishing experts will remove all traces of the old sealer, replace it with a new top coat and then buff up the surface to a sparkling, good-as-new shine.This will not only restore the professional look of your floor but will also extend its durable life by preventing soil, dirt and abrasive grit from penetrating the surface. Hardwood floors are a beautiful, eye-catching investment – when they are properly and regularly maintained. Nicks, scratches, stains and water marks will gradually wear away at the high-gleam surface leaving your hardwood floor more of an eyesore than a professional asset. CLA Commercial Cleaning uses methods and innovative techniques to restore the high-shine finish by sanding or screening the wood grain surface and reapplying the polyurethane seal to perfection. This will further protect your floor and make it more durable as well as more beautiful. Maintaining and restoring natural stone floors is best left to the experts. It can be a messy, dirty, wet and disruptive process if not carried out by professionals with the proper techniques and equipment. The experts at CLA CommercialCleaning have restored numerous marble, slate, granite, limestone and many other types of natural stone floors throughout New York City and Tri-State. We know exactly how to clean, grind, hone, seal, diamondize, crystallize and seal to restore your natural store floor to its original beauty – and how to preserve it with extra-tough sealers that will keep it that way for many years to come. For a FREE, no-obligation estimate in New York or the Tri-State area of the costs of waxing and refinishing your floor you cancontact us by calling 646-532-3750 or write to us online and we will get back to you within 24 hours. 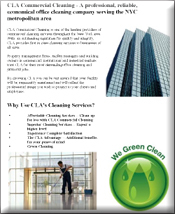 CLA Commercial Cleaning – experts in floor waxing, carpets, windows, cleaning New York and the Tri-State's residences, office and business – and we offer porter,janitorial, and Superintendent services too.